U.S. #1725 – Silk Cachet First Day Cover. Then in 1775, Juan Bautista de Anza embarked on an expedition to California to find locations for two missions, a presidio, and a pueblo (town). During this trip, he chose the sites that would become the Presidio of San Francisco and the Mission San Francisco de Asís, the Mission Santa Clara de Asís, and the pueblo of San Jose. Though he didn’t personally found the settlements, he’s often recognized for his role in their creation. U.S. #1725 – Fleetwood Plate Block First Day Cover. Following Anza’s plan, José Joaquín Moraga officially established the town as the Pueblo de San José de Guadalupe on November 29, 1777. This name honored Saint Joseph and the Guadalupe River along which the town was settled. 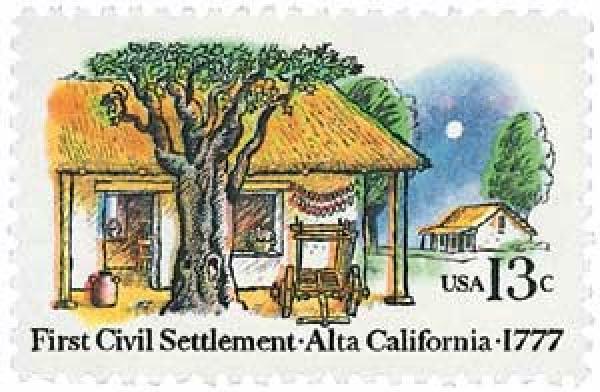 San Jose was the first civilian settlement in California. Soon colonists arrived to establish a farming community, as the settlement’s sole purpose was to function as a granary, since the presidios were not self-sufficient. By the following year, the population reached 68 people. Because the area was prone to flooding, San Jose was moved about a mile away in the 1790s. U.S. #1663 pictures the California State Flag, which was created during the Mexican-American War for the Bear Flag Revolt. In the coming decades, San Jose’s population continued to grow, reaching 900 people by 1845. 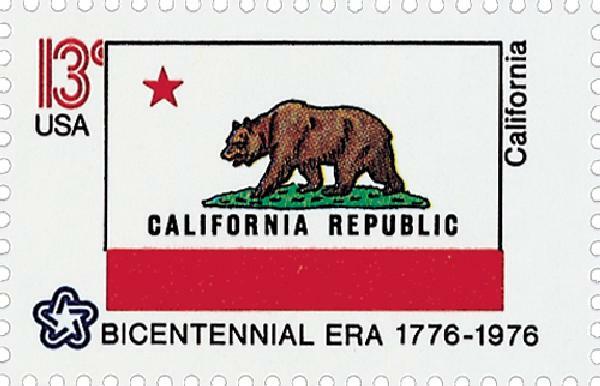 After the Mexican-American War of 1846-48, California became a U.S. territory. 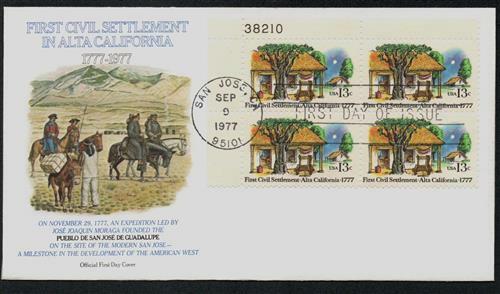 San Jose served first as the territory’s capital, and later as the state’s first capital after California joined the Union in 1850. It remained the capital until 1854 when it the capital was moved to Sacramento. 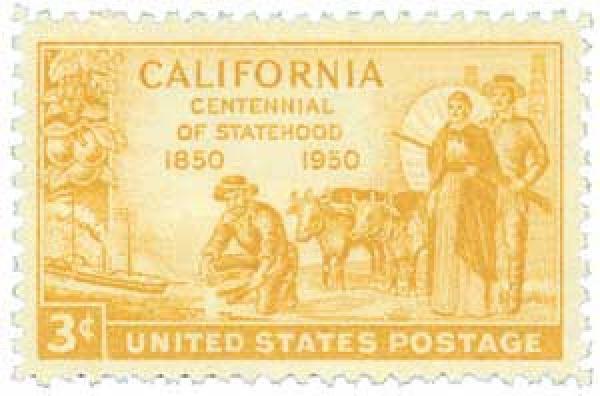 U.S. #997 was issued for the 100th anniversary of California statehood. This entry was posted in November 2017, This Day in History. Bookmark the permalink. 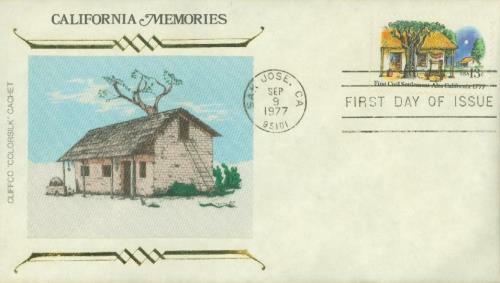 3 Responses to "This Day in History… November 29, 1777"
The location of California’s state capital is a bit complicated. San Jose was the state capital from 1850-1851, but two cities in the north Bay Area briefly served as the capital: Vallejo from 1852-1853, and Benicia for thirteen months from 1853-1954. The capital moved to Sacramento in 1855 where it has remained ever since. Just think…A couple of hundred years later California’s population is nearly 40,000,000! I seem to remember that Monterey was an early capital of California, but this must have been while the state was still in Mexican hands. Can anyone elaborate on how or when the capital was moved to San Jose?